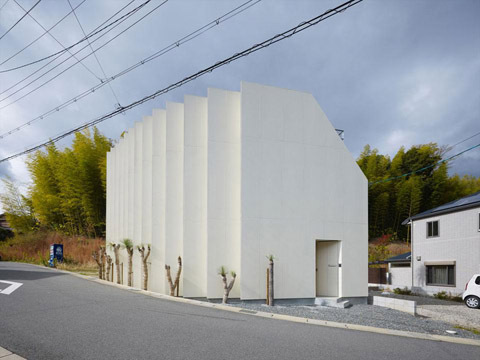 In Kyoto, Japan a sculptural volume assumes an intriguing presence in the suburb context of Muko. 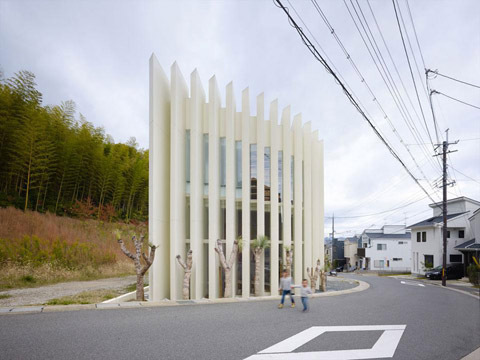 A two-story building stands perfectly disguised behind a wall of concrete vertical bars with a total floor area of 100sqm. This sort of formal mask contributes to its enigmatic appearance while creating the perfect filter from the street. Actually, the main facade curves around the south-east edge of the building to track the shape of a road running alongside. Two-story high windows are positioned between each of the concrete vertical bars allowing natural light to filter through the wall, casting a diversity of shadows across the interiors on different time of day. The absence of boundaries between site and street give space to a more liberal connection to House in Muko. 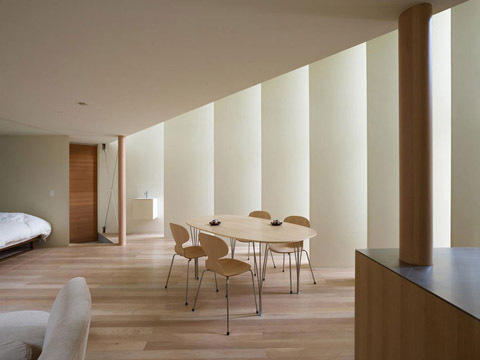 The front door is placed beyond the last concrete wall and leads into an open-plan living and dining area that occupies most of the ground floor. A small bedroom sits at the back of this space and is completely filled by a double size bed, but inhabitants can turn this tiny compartment into an extension of the living room with a set of sliding partitions. 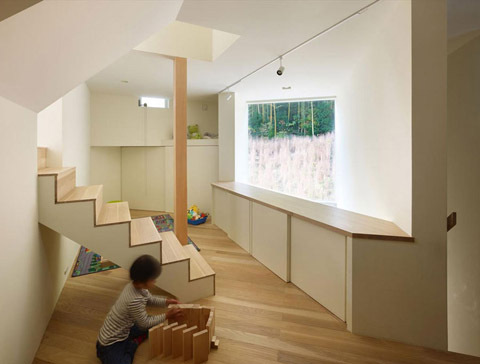 A staircase leads up to the children’s bedroom on the first floor where a balcony overlooks the level below. Last, but not the least, another staircase gives access to the bathroom and washroom and ends its journey in a magnificent rooftop terrace. 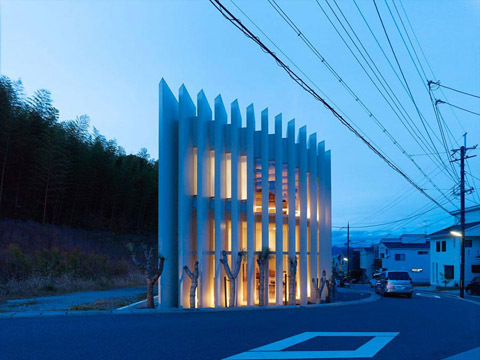 All is clad in white in-and-out this enigmatic building, only wood interrupts this constant premise, standing warmly present in structural elements, pavements and furniture.